LAS VEGAS -- In a stunning development, both fighters who competed in the main event of UFC 183, Anderson Silva and Nick Diaz, failed their drug tests. Silva, the legendary ex-UFC middleweight champion who is widely regarded as the greatest mixed martial arts fighter in history, tested positive for two anabolic steroids, drostanolone and androstane. For the third time in his career, Diaz had elevated levels of marijuana metabolites in his system. Even more stunning news about Silva is that the drostanolone and androstane were discovered as part of an out-of-competition test given by the Nevada Athletic Commission on Jan. 9. But the Salt Lake City-based Sports Medicine Research & Testing Laboratory did not return the result to the commission until Tuesday. Commission chairman Francisco Aguilar could not explain why he did not receive the test result sooner. He referred questions to Dr. Daniel Eichner of SMARTL, but Eichner could not be reached. Aguilar did say that had he gotten the results in a timely manner, he would not have allowed Silva to fight. "I would have had no problem calling the fight once I had this result," Aguilar said. "Those are not acceptable substances. But at the very least, by doing this out-of-competition test, we found this. We wouldn't have known had we not done the out-of-competition test." Silva's two post-fight tests have yet to be returned. That includes one screen for drugs of abuse and another screen for performance enhancing drugs. Silva was making his return to MMA competition Saturday after suffering a gruesome broken leg in a title fight against Chris Weidman on Dec. 28, 2013. He won a unanimous decision over Diaz in the non-title main event of UFC 183 at the MGM Grand by scores of 50-45, 50-45 and 49-46. 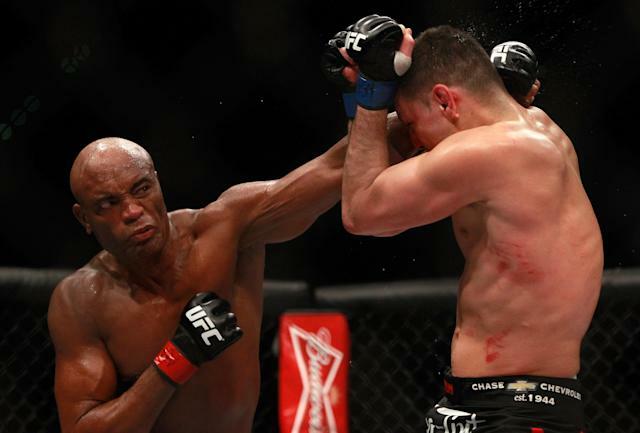 On February 3, 2015, the UFC organization was notified by the Nevada State Athletic Commission that Anderson Silva tested positive for Drostanolone metabolites on his Jan. 9 out of competition drug test. UFC’s understanding is that further testing will be conducted by the Commission to confirm these preliminary results. Anderson Silva has been an amazing champion and a true ambassador of the sport of mixed martial arts and the UFC, in Brazil as well as around the world. UFC is disappointed to learn of these initial results. The UFC has a strict, consistent policy against the use of any illegal and/or performance enhancing drugs, stimulants or masking agents by its athletes. Silva will face a disciplinary hearing. On Feb. 17, the Nevada commission will move to temporarily suspend his license pending a full hearing. First offenses in Nevada generally receive a nine-month suspension. Diaz tested above Nevada's 150 ng/ML allowable limit for marijuana metabolites, meaning he'll face discipline as a third-time offender. Diaz previously tested positive for marijuana after a Pride card in Las Vegas on Feb. 24, 2007, and after UFC 143 on Feb. 4, 2012. The level of marijuana in Diaz's system is not yet available. Quest Diagnostics, which analyzed Diaz's sample, only noted that it was above the 150 ng/ML cutoff. Ed Soares, Silva's manager, did not return a call from Yahoo Sports. UFC president Dana White declined comment and pointed to the UFC's statement. The commission will have to debate what to do with the result of the fight, but it is likely going to be ruled a no-contest.